As the editor of a major technical news website (this one) I am forced to upgrade my iPhone every year so you can read my refined opinions. Let’s do it. … but a helpful soul on Twitter caught wind of my whining and alerted me that the website was back up and I was able to place my preorder. 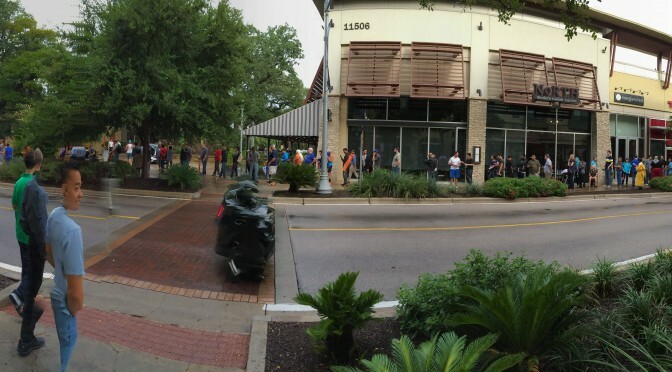 This is a panorama I shot of the line outside of the Apple Store at The Domain (left) sometime around 8:30 AM. Click to enlarge. I’ve only had the phone for a few days and so far it seems like the battery lasts longer than the iPhone 5s, which was just fine. This is not going to be a concern. Apple Pay. I like my wallets to be thin. The added bulk of a credit card kills me. So anything that helps avoid carrying more stuff in my wallet is welcome. Unfortunately, Apple Pay isn’t out yet so I can’t test it just yet. And not every place will take it so I will still have to carry the credit card for the foreseeable future. Dang. So read “Apple’s iPhone 6 Has Finally Convinced Me To Ditch My Compact Camera” and look at this crazy photos taken in Iceland and watch this video taken in Disneyland which is impressive because of how there’s no shake and how quickly the video adapts to the changes in darkness and light. The camera does have one big drawback: the lens sticks out a little bit. If you use a case, then it’s a non-issue. If you don’t use a case, the phone will wobble on it’s invulnerable sapphire lens. Me? I use a case. 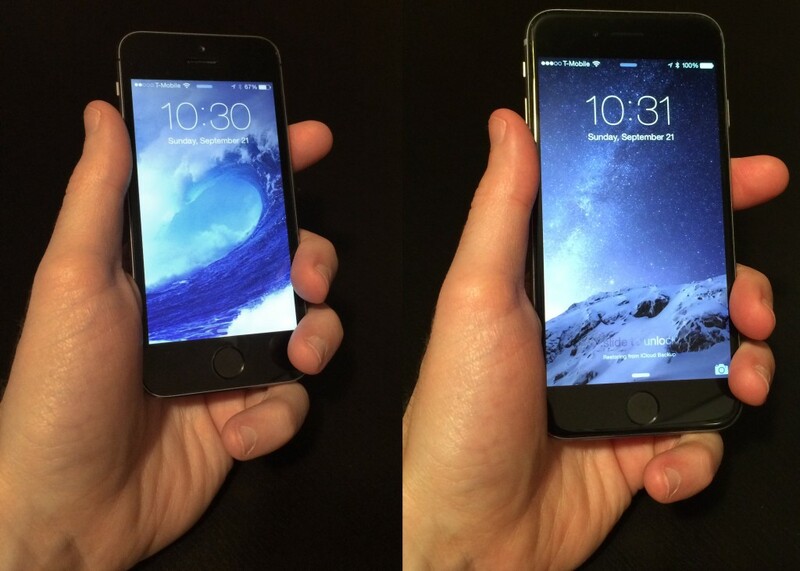 Left: iPhone 5s. Right: iPhone 5. Hand model: Marcos. I tried to make the scale of the photo roughly the same. The size difference is striking. It’s big, and this is the “small” model, not the gigantic iPhone 6 Plus. I get it: the demand for a larger iPhone was huge. And then there is that dirty little secret every other phone maker hasn’t told you yet: making large phones is easier. Apple can’t keep doing both forever: competing in specs and make the phone smaller. The market has spoken loud and clear. The giant iPhones are upon us. The phone is very thin though, even with the case. And since it has rounded corners it slides in and out of my pocket just fine and doesn’t bother me at all – which was a pleasant surprise. But oh boy, one-handed use suffers big time. You can’t reach the top of the screen without some impressive hand calisthenics , and the phone feels top heavy, precariously close to tipping over. In the past years while at the public restroom at work I’ve accumulated accolades from both peers and higher ups due to my ability to keep up with my RSS feed while I urinate. This is going to be a lot harder now, and just imagine the embarrassment when my phone falls into the urinal while I try to tap that out of reach button (note to self: look into this). Reputations take years to build up, but a mere instant to destroy. Reachability may help, but it’s not yet second nature to me and it still seems like an inelegant easy way out. The original iPhone was a pleasure to use with one hand – at the expense of screen real estate. The new iPhone flips the table. Perhaps modern medicine can come to the rescue? The phone with its A8 processor feels faster, which is cool but not in a way you notice right away. In my experience, jumps in performance were similar across iPhone generations with the notable exception of the 3GS which was a much faster than its antecessor. But the speed bump is definitely there, and when you go back to use the previous phone, it feels sloooow. Every small gain in performance makes the thing more pleasurable to use and it adds up over time. The phone now has a barometer, so not only do you know how many steps you take in a day, but how many floors you climb. I will be testing this more this week. And I am selling my old factory unlocked pristine 32 GB iPhone 5s. Great phone, usable with one hand anywhere in the world. Supplies are limited! Hurry up! The lock button was moved from the top to the right of the device. This is a good idea, because the top is hard to reach with one hand. But there’s a drawback: the lock button is now opposite from one of the volume buttons, so if you squeeze the phone to lock it, you may end up pressing the wrong button. Touch ID (fingerprint sensor) seems to be a lot faster and a lot accurate. This may or may not be my imagination or due to the fact that I just programmed it – but my guess is that it’s a new revision of the hardware. Apps that aren’t yet updated for the iPhone 6 look zoomed in. This makes everything look larger, means that the app doesn’t take advantage of the added screen space, and that the keyboard is larger. The last point is a big problem, since one relies on muscle memory for fast typing, and switching keyboard sizes is ver bad for that.